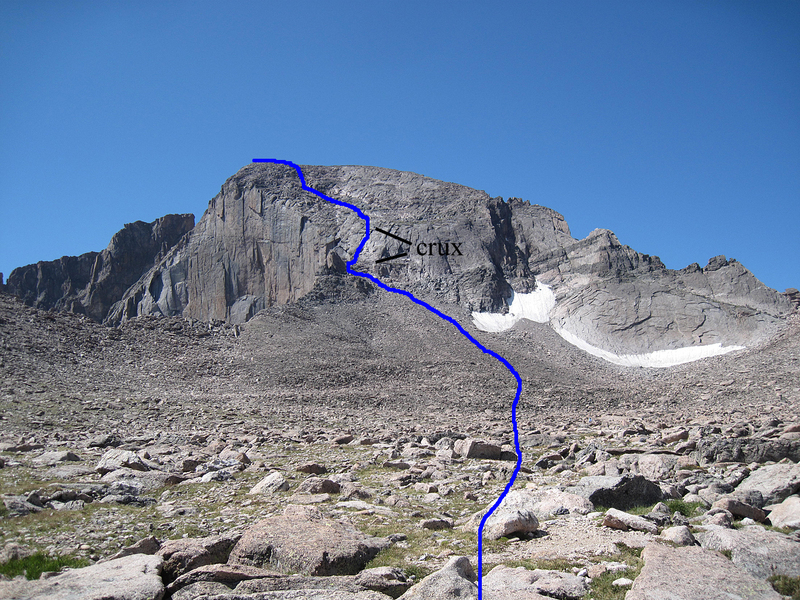 As the end of summer approached, my girlfriend and I decided to take a week-long trip to climb Longs Peak and Mount of the Holy Cross, two classic peaks we had previously attempted but not made the summit (Holy Cross, in fact, we had attempted twice). We had decided not to climb the standard Keyhole on Longs this time but to instead try our luck at the North Face via the Old Cables Route. The North Face, we had heard, was a “technical” route at 5.4, but was quite easy and actually the fastest and most straightforward way to and from the summit as it takes a direct course from the boulderfield. 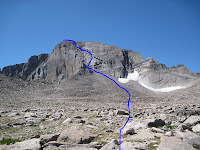 It is the fastest way off Long's peak if you have a rope, also, so a good route to learn. More on that later…. Since we were going to travel so far and be carrying our climbing gear, we had a general idea that we would also be doing some other climbing. We had not decided where. 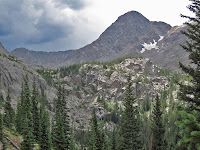 Other areas within Rocky Mountain National Park like Lumpy or Jurassic Park or even nearby places such as Boulder or Eldorado Canyons were not out of the question. Since we had decided that our original plan, to follow Longs with an ascent of Wham Ridge on the San Juan’s Vestal Peak, entailed a bit too much driving, we thought we would clean up another peak, Holy Cross on the way home. 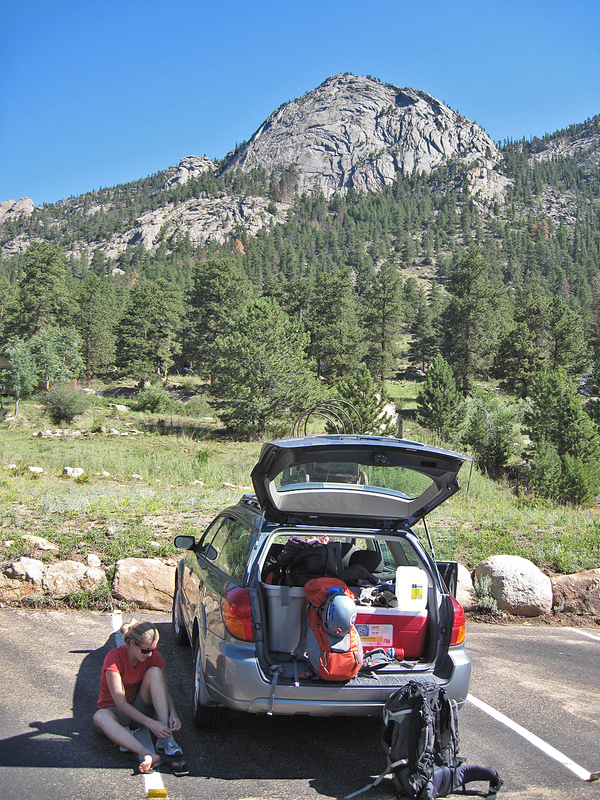 Though our original plan was to climb Longs Peak our first full day in the park, we decided on arrival that a day to “acclimate” seemed more appropriate. We decided to spend the first day sport climbing at Jurassic Park, a collection of granite fins and slabs just off the Peak to Peak Highway. Although Jurassic Park seemed like the tourist place to climb in RMNP, we wanted a casual day to rest and prep for an attempt at Longs’ North Face. Jurassic Park also is home to a rather famous climb, Edge of Time, which I (admittedly, much like a tourist) was itching to at least photograph if not climb. Given the park’s popularity and the ease of accessing these granite fins, we knew we were in for crowds. We arrived at Lily Lake late morning, somewhere around 10:30 am, and did the short but surprisingly steep approach hike to the cliffs. 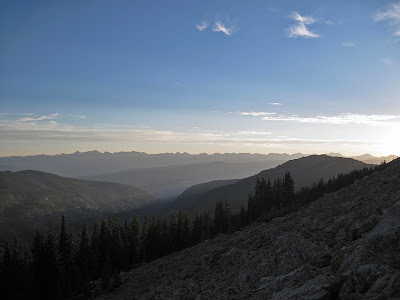 The trail was steep and hiking with a full climbing rack is always a struggle, but if either of us was tired we didn’t dare admit it, knowing the approach we were soon in for on Longs. It seemed we were late, and many of the good climbs, including the famous Edge, were already taken. With few options, and wanting an easy warm-up, we found ourselves gearing up at the base of a climb called Index Toe on a slightly slabby wall called the Dinosaur’s Foot. The climb was rated 5.8+, which I figured would be no problem to onsight for either of us. 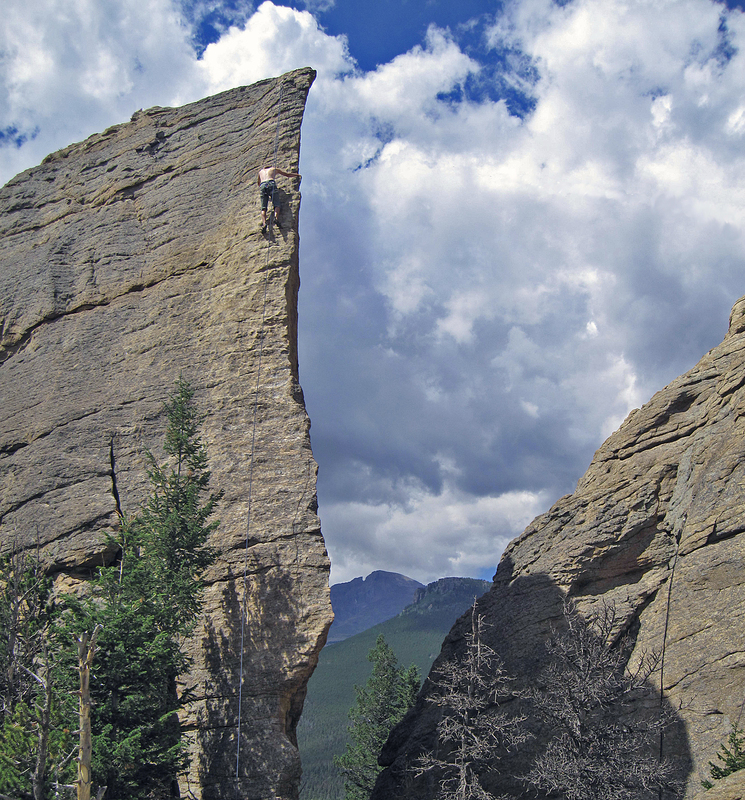 Ella onsighted the route with only a mild hesitation at the crux. When it was my turn, however, I took the lead confidently only to find myself hopelessly stuck, flailing and second-guessing until I took a fifteen foot whipper infront of a sizeable crowd of onlookers. Pumped, dejected, and with an admittedly bruised ego, I lowered back to the ground in shame. After some cussing and stomping back and forth, however, I toughened up and went back up and stuck that redpoint. After the minor set-back, we toured through the areas climbs and climbed a few other routes. The Edge of Time, unfortunately, never did (that I saw) become free, so after three or four more pitches of good fun (and no more falls) we retreated to our campsite and called it a day. That evening we sorted out our gear and packed out packs for Longs the following morning. Longs is a notoriously lengthy climb by any route, and the weather had been consistently bad in the afternoons the past few days. We decided therefore to wake at midnight, that way we would be well back down before the afternoon storms. We had climbed plenty of mountains by this point, and were quite used to getting the 4 or 5 am “alpine early” start. But midnight was ambitious and we knew it was going to be tough. However, we thought it gave us the best chance to get the summit despite the poor weather outlook. Shortly after 10 pm, we were wakened by a sudden deluge of rain and crashing thunder. We had barely gone to bed and were hoping to wake up in less than two hours. When midnight came and the storm hadn’t let up, we made the decision to forgo our attempt on Longs and go back to sleep. When morning came, we rose at 7:00 am to find perfect blue skies; an excellent day for climbing! Disappointed that we had missed a good chance to climb Longs, we decided we would try again the following day. It is hard to waste a perfect day, however, and we decided after a leisurely breakfast and coffee to attempt McGregor Peak in Rocky Mountain National Park. We had read about the Left Standard route, an easy, three-pitch 5.3 climb up the left side of the mountain’s slabby Southwest Face. According to the book, the approach was an easy 30 minutes car-to-cliff and there was a walk-off after a few easy pitches. No problem…. We parked the car at the Fall River Visitor’s Center and stared up at the impressive feature above. Shouldering our packs, and starting toward the cliff, Ella commented that the approach “didn’t look so bad” and we started happily up the hill toward the glistening slab of granite above us. This would be a good little prep for our day on Longs tomorrow, we thought. After a good hour of sweating, growling, and cursing up a steep and much longer than anticipated climber’s trail, we reached the bottom of the crag below the Right Standard route and Camel Toes at last. Hundreds of feet of granite towered above us, and we felt excitement for the impending climb. All the effort of the approach, which had been considerably more challenging than expected, was about to pay off. A short, bushy hike to the left side of the cliff brought us to the base of our intended route. I geared up confident, intent to move quickly up the mountain placing as little gear as possible on the easy 5.3 climbing. After consulting the topo one last time, I started up the rock. The first pitch proved to be excellent mild climbing, though slightly more difficult than expected, likely 5.5 and maybe even 5.6 in spots. I blew off this discrepancy, guessing that I had been slightly off route on the confusing network of grooves and dihedrals. After about 170’ I found a large chickenhead lassoed with webbing and rap rings and quickly established an anchor to top-belay Ella while she cleaned the pitch. 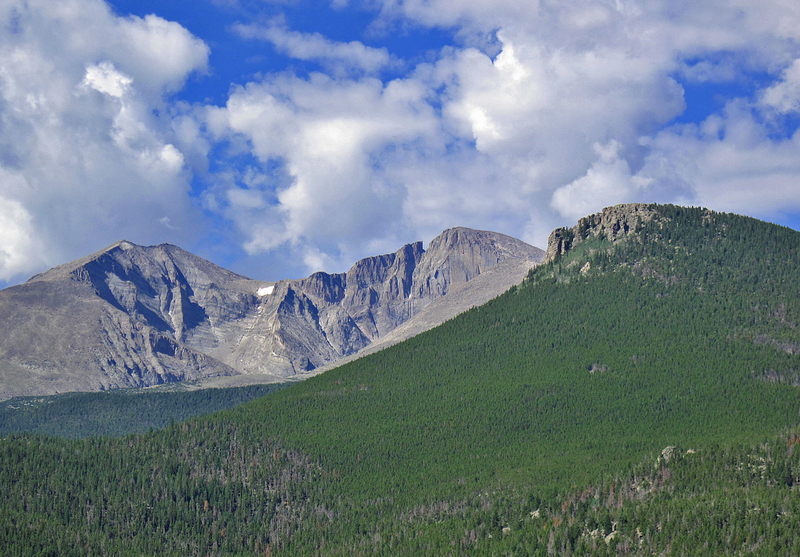 Though it was still before noon, storm clouds were just starting to build in the direction of Meeker and Longs Peak. I began to feel a little uneasy about being exposed on the large face should the weather deteriorate. Ella reached the belay and after a quick re-shuffling of the gear started up ahead. She pulled an easy roof and disappeared from view. A breeze was starting up and once she rounded the corner it was impossible to communicate. Once or twice the rope would stall for what seemed like a long time and I would wonder what problem or climbing move she was pondering. The belay stance was not flat and quickly became uncomfortable. 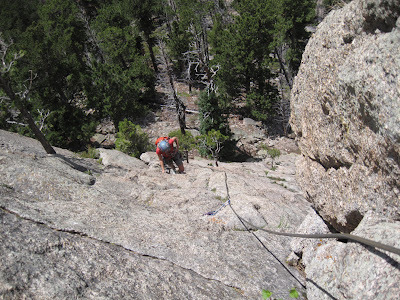 But every time I felt the rope eventually pull tighter and hiss quietly up the rock above me. When only about twenty feet of rope remained, I yelled up to tell her so but only a muffled response came back. I couldn’t be sure if she’d heard. 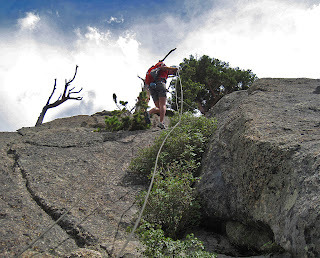 With less then three feet to go the rope suddenly stopped and a few minutes later it pulled tight and I was informed by a distant voice from somewhere far above me that I was now on belay. I dismantled the anchor and started up the second pitch. Ella’s second pitch weaved around a bulge and into a long, slanting dihedral with excellent exposure, perhaps the best 5.4 pitch I have ever climbed. Impressed with her economy of gear placements, at times running it out thirty or more feet on continuous 5.4, I reached her belay stance on a comfortable ledge beneath a roof. The spot seemed to match the guidebook beta. After a quick break and some water I arranged my rack and considered the options ahead. There were two: take on the roof left heading more or less directly toward our eventual goal but on rock clearly harder than 5.3 or do a dicey traverse right in ostensibly the wrong the direction. I decided on left. On route or not, the rock looked within my ability and reasonably protectable. Carefully bouldering up to good crack with no intention of Factor 2-ing on Ella’s belay anchor (which I am sure was solid but you never want to test), I threw in a piece and pulled upwards feeling the rush that only alpine multi-pitching can give, even in this mild form. The combination of the wind, the impending storm, and the exposed position above the beautiful valley in Rocky Mountain National Park made the afternoon very exciting. I thrutched a bit awkwardly over the roof following what seemed to be the path of least resistance at 5.7, threw in a blue alien in a small crack and rounded an arête onto yet another unbelievable but easy ramp dihedral. This one probably 5.4. Comfortable I threw in a BD #1 and reached a bit of a fork in the road. The ramp ended on a small pinnacle and a large expanse on rock opened above. Slightly to the right above me there was another dihedral system with obvious jugs and looked well protected. My instinct was to go for it but I soon encountered a troubling move that felt borderline 5.9ish. Already I was a good ten feet above my last cam. A twenty footer on a ledgy slab was not what I had in mind so I downclimbed a bit pondered the other option. About twenty feet left was a very large dihedral. This system I guessed, was the one we were supposed to be in all along, hence the much higher than 5.3 climbing. I decided to do a rising traverse over to it. 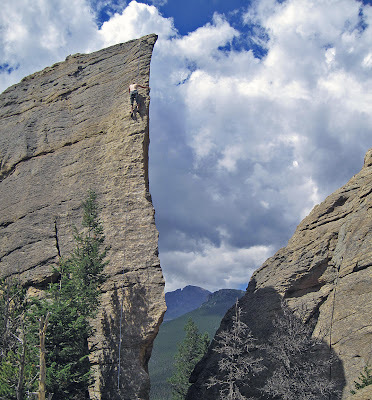 I soon found myself in a dicey predicament on tricky rock on the face between, facing what looked like a difficult move to reach the dihedral. To add to it, I was now a good twenty feet above my last cam and had added swing potential to the possible fall. I started to traverse back feeling the rise of that panicky, might fall feeling knowing that any fall now could be catastrophic. Ella had disappeared from view long before and the rope felt heavy with drag on the winding pitch despite my liberal use of slings on all placements thus far. I wanted now to return to the move right but the downclimbing traverse back seemed suddenly much harder. Panic started to sink in. The leg started to do the Elvis wobble. I tried to sink a nut in a seam in front of me but I knew the placement was pathetic and useless. I would take on it much less trust it for even a small fall. Feeling stuck and facing what was could be catastrophe, I started up the unprotectable seam knowing that my only way out of this dilemma was up. I climbed ten more unprotected feet at 5.8 in a blur, the dihedral still a dangerous reach. Then ten more. The very serious danger of falling now threatened my every move. I heard a tinging sound below me and I looked down in time to see the meager nut I had placed slide down the rope out of view. It was disheartening despite that I had already known it was useless. Ella yelled something vague far below me. My leg started shaking worse than ever. I climbed on. Another fifteen feet. My last piece was out of view, some fifty feet or more below me now. Finally I reached a small ledge at the base of a short dihedral and threw in a BD #.4 and clipped in. I felt like howling, my head was spinning. I placed a second cam inches away just to ensure that that runnout was behind me. I’d never before faced the possibility of a 100+ foot fall while negotiating tricky 5.8. Another 50 feet farther and I reached a ledge where I could tell a walkoff might be possible. I built an anchor with three bomber pieces feeling safe at last and belayed Ella up. We reached the top happy to have made it without real incident but anxious to get down to avoid what looked like rapidly building weather. While the exposure wasn’t overly threatening on the ledge it was still there. Following the path of least resistance we reached a long section of what looked to be slippery 5th class downclimbing. Luckily we had kept our harnesses on almost expecting something like this. No matter, a nearby tree was well slung and we did three single rope raps to gully where a brushy class 3 to 4 downclimb drought us back to the base of the wall. A long, slippery hike down to our cars and we were thoroughly exhausted. 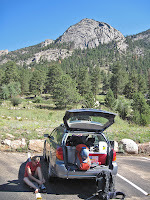 After a big dinner in Estes following our unexpected adventures on McGregor Peak, we returned to our camp at a Forest Service lot just off the Park near the Longs Trailhead. We sorted out our gear and prepared for weather that had been threatening all afternoon. The slow-moving storm reached us at 6 pm. We set the alarm for 1 am, hoping that the storms would cease by then. Given Longs reputation as a long, exposed mountain by any route, we wanted to be well off the mountain by the time the afternoon showers arrive, which had been anytime between 12 and 6 pm on the mountain itself. It was still raining when we decided to try to sleep at eight. But when the alarm jarred me out of a very strange dream at 1 am, the skies were perfectly clear and I had a feeling that nothing was going to stop us this time. I felt like we had only ourselves to get in the way. We hit the trail at 1:45 am along with not a lot but several other climbers. Most were headed to the Keyhole, one to the Diamond. 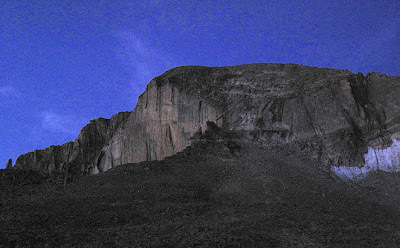 We hiked the long approach, our packs heavy with climbing gear, in the dark for several hours before there was any sign it was getting lighter. The lights of Boulder and Denver sparkled below and for some strange reason I almost liked them. They couldn't get me up there anyway. We reached the bottom of the Boulder field sometime around 5 am. The Diamond materialized out of the darkness. As a lover of rock and rock climbing it was amazing to see this world famous face at such close range. There is also something very special about an alpine sunrise. See a few of these in a place like this and the question “why climb mountains?” becomes irrelevant. An hour later we left the mounting Keyhole crowd and snaked up the scree towards the crux of our route. At 6 o’clock we were getting very close and that awesome feeling of exposure was rising in me. Perhaps it was the apparent though mostly invisible presence of the east face which was very close now. We reached the bottom of the first pitch as the first beams of direct sunlight crested over the ridge. I racked up to lead. Pitch one was a ramp-dihedral, reminiscent in my groggy, sleep-and-oxygen deprived brain to what we’d done yesterday. It was easy, though wet. I place a red C3 and a hex and topped a ledged to the first eyebolt. The longer, crux pitch was just ahead and it looked more confusing and perhaps longer than expected. I belayed Ella up, re-racked and continued. This pitch was immediately more difficult, and quickly I encountered water. The recent rain had saturated the mountain. The surface of the rock was wet and slippery, and the cracks gushed like a small creek. I did a strange, high foot jam in a fist-sized crack and pulled up to a ledge. My rock shoes were thoroughly wet. After slinging an eyebolt, I moved out onto some unprotected friction climbing on the face to avoid the water before returning. I placed a cam in a wet crack, having few other options, and continued up to the final crux, a wet “roof” before a final eyebolt. After deliberating for a minute about the easier way to surmount the roof (really a section of vertical rock on an otherwise slabby ramp) and not falling, I did a high-step move left to avoid the running water at something like 5.6 and anchored to the top eye-bolt to belay Ella behind me. 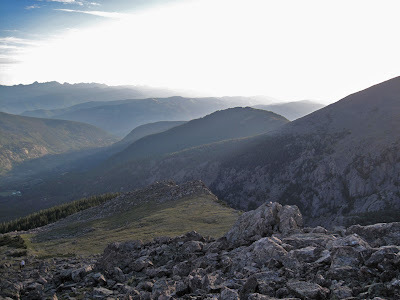 Once we were through the technical section we tiptoed carefully up the loose, soggy class 3 terrain and reached the summit just after 8 am, six hours and fifteen minutes after we set out from the trailhead at the Longs Peak Ranger Station. We didn't stay long on top, feeling the length of the descent we still had ahead. 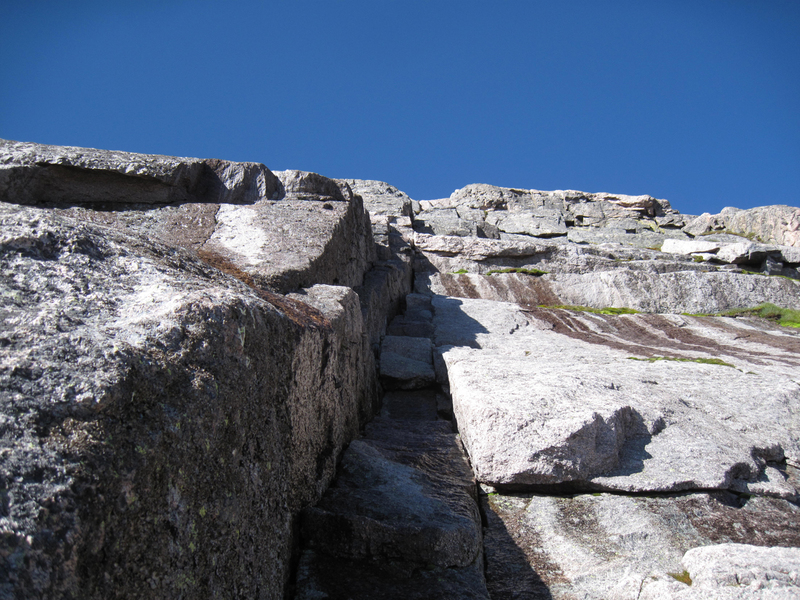 We tiptoed smoothly down the loose north face and reached the eyebolts in good time. Three single rope raps off and we were at the bottom. We took a minute to peak over the edge at a perfect view of the Diamond. 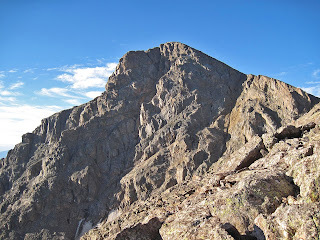 Though the hike back to the car was long and arduous, we were ecstatic by having finally climbed Longs Peak. We celebrated with a huge pizza in Estes Park before traveling to Boulder for a day off with friends. Feeling a bit run down on the way home, we stopped anyway at the trailhead for Holy Cross. It would be our third time attempting this mountain. 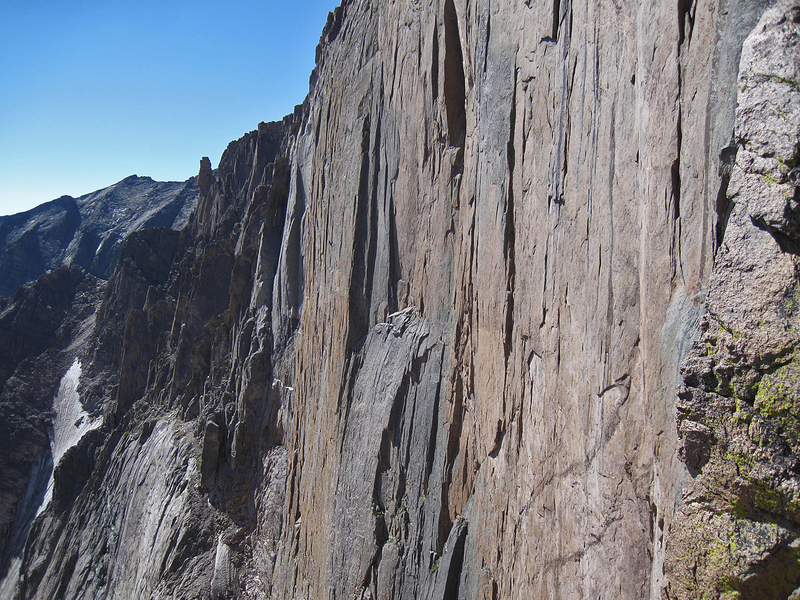 While the North Ridge of Holy Cross was a technically easy route, it was in one of our favorite little corners of Colorado. Things had been going our way on this trip so far, though not without adventure. We’d been able to summit Longs as well as climb both sport and trad in RMNP. We felt destined for success. 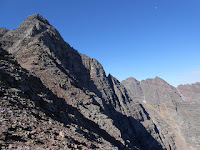 After sorting out our gear and packing our backpacks we started up the trail toward Half Moon Pass, the first obstacle barring an easy ascent of Mount of the Holy Cross. Getting to the top of Half Moon Pass takes about two miles and 1,300 feet of elevation gain. Despite having given ourselves only one day off after Longs and the climbing in RMNP, we felt strong and made it to the pass’s summit in good time. After a brief rest and snack, we dropped down towards East Cross Creek, getting our first views of Holy Cross and the basin. 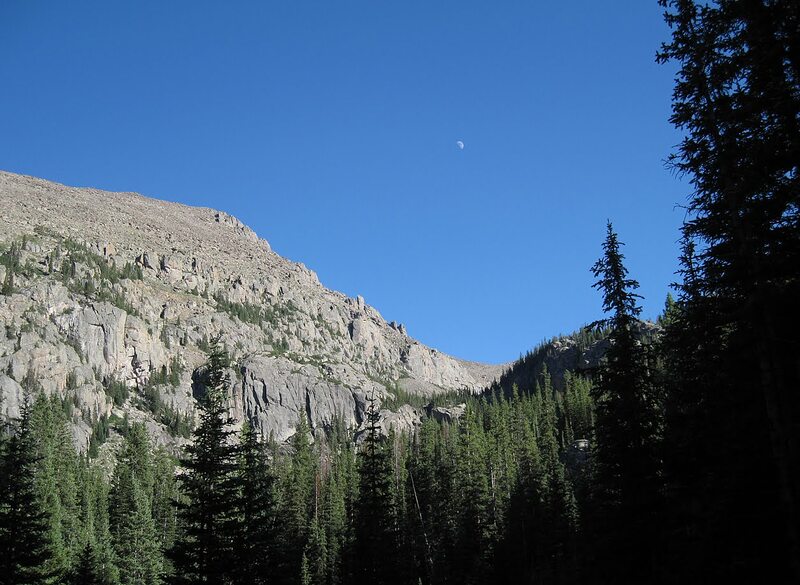 To me, this view—looking down from the trail into the East Cross Creek basin with its granite cliffs, waterfalls, and Mt. of the Holy Cross towering over it all—is one of my Colorado favorites, right there with the Maroon Bells or Chasm Lake or the Grenadiers. This is a special place. We set up camp at the bottom of the canyon after descending a thousand feet. For all the work we had only netted 300 measly feet since the trailhead. Feeling a strange combination of fatigue from our full week of climbing and contentment to be in such a beautiful place, we stretched a set of hammocks out in the trees and played a casual game of Travel Chess in the beautiful afternoon. After dinner we took care of our chores—dishes, pumping water, hanging our food, etc—and laid down once more in the hammocks while the evening rolled on. We set our alarm for 5:00 am. Morning comes early, and in no time we found ourselves plodding upward yet again as the sun rose over the mountains. Amazing hues and long shafts of first light illuminated the nearby peaks and ridges of the Gore Range. 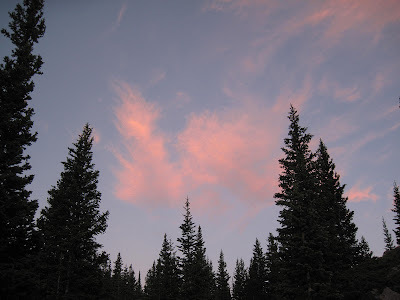 We climbed quietly through a pristine forest to treeline where the north ridge proper began. We hiked uphill along an increasingly rock-studded trail, past a CFI crew working hard to more effectively channelize future Holy Cross traffic to a flat section at the top of Angelica Couloir. The last section of Holy Cross is steep scampering (solid class 2) up three hundred feet of surprisingly stable talus. Starting to feel the effects of well-over 10,000 feet of vertical gain in the past five days and the usual hypoxia of the 13,000+ elevation level, I found myself having to take more frequent breaks. Suddenly, the terrain flattened out and we were on the summit. I set my bag down in a flat spot in a cairn-shelter and stood on the caprock with the embedded benchmark. 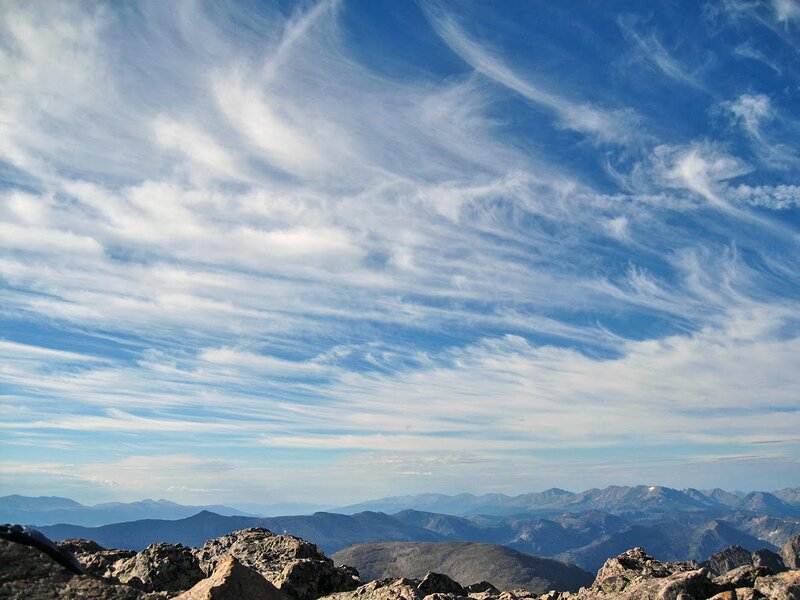 14,005’, Colorado’s third-lowest fourteener. We spent some time on the summit, talking with other summiteers and peering down the Cross Couloir on the peaks other face. The North Ridge Route on Holy Cross is perhaps my favorite class 2 route on all the fourteeners I have done (29 total to this point), but one significant downfall is the lack of any vantage of the famous cross. You must do Halo Ridge or the Cross itself to see it if you are climbing the mountain. After a good half hour of snacking and talking, we started back down the mountain feeling surprisingly fresh and in good spirits. Before too long we were back at camp where we rested briefly before packing up and starting out escape. Storms built rapidly as we hiked back up—with fully loaded packs now—Half Moon Pass. Stopping at the last overlook we said our final goodbyes and plodded the final few hundred feet of elevation to the pass’s summit. The sky was getting dark now, and sharp growls of thunder seemed to be coming from both the east and the west. We cleared Half Moon Pass, however, with only some sprinkles and no lightning closer than 8 seconds between flash and boom. With what was left of our legs, we hustled down the last two miles to our car to avoid being thoroughly soaked in the mounting weather. When the parking lot appeared at last we celebrated with a little cheer and high five. Second later the pack were off our tired shoulders and the hiking boots were off my feet replaced by Chacos. Life seemed good. Overall it was an excellent seven days in some of my favorite Colorado places. Longs Peak is perhaps Colorado’s most diverse, famous, and dramatic fourteener. Its steep ridges, rugged stature, and signature east face beckons with the power of a siren to those who love the mountains. Being able to get out and sample just a small flavor of what that amazing mountain has to offer and to stand on its summit at last after a previous failed attempt was a privilege. The entire Estes/RMNP region, in fact, is a wonderland of perfect granite and serene alpine terrain. I am excited to go back. After two failed attempts at Mount of the Holy Cross, it was a relief to finally stand on the mountain’s summit. I do believe after this trip that Holy Cross is possibly in the top five of the over 30 fourteeners that I have climbed or attempted. 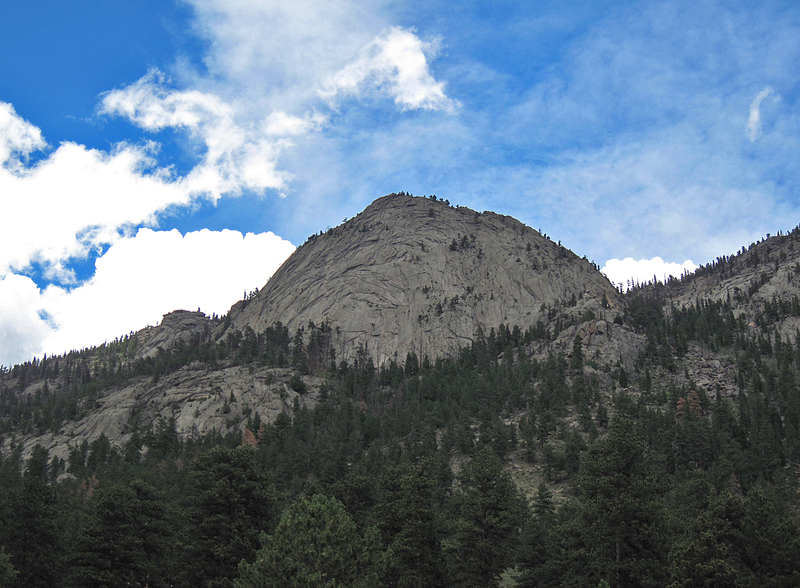 It is simply one of the most beautiful peaks in the state. 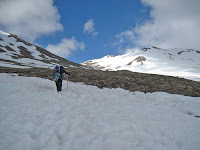 I am excited to visit the region again, perhaps to climb Halo Ridge on perhaps one of the couloirs. 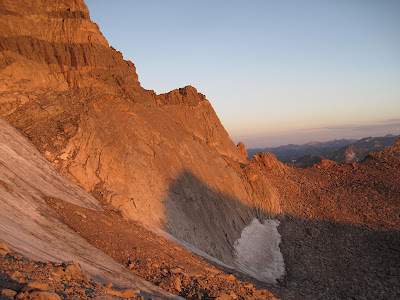 Even the North Ridge standard route, while not technically challenging, is a route that I would love to one day return to.